Another great weekend has passed, packed full of adventure and travels as well as new achievements. This weekend I completed my first 10km Wolf Run in Coventry and I also attended the Parallel running event at the Olympic Park in Stratford, London. 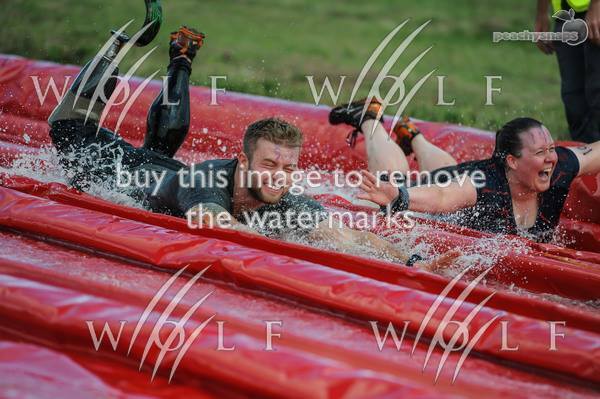 The Wolf Run is an obstacle course that is in Coventry/Leamington Spa area that has a large following on their social media accounts and I believe about 8,000 people pass through the course over a weekend. On Friday, after work, I headed up to stay with a friend of mine and then set off on Saturday morning ready for the Wolf Run. We arrived and I was very impressed to see that they had disabled parking that was 1) labelled and 2) actually close to the main section. This filled me with hope as I went to collect my number and registration information from the main tent. The tent was very organised and I approached the desks, to find that names were laid out alphabetically and you simply approach your section to receive your documents. Within my pack, I found my number, a band and an envelope that should be used if you needed to drop your key off while on course. My band represented the size and gender of the shirt that I would receive at the end and again, I was very impressed. The number system was incredibly simple but very effective. Waves were sent off and your number dictated which wave you would be in. Numbers 1-250 were in the first wave, 250-500 in the second etc. The village was quite small so we could easily hear the PA to let us know our wave was about to go. We headed into the start pen and started our warm up, which was lead by some pretty fit individuals. The countdown started and off we went! Within the first few hundred meters, we had conquered the first set of hay bales and we were on our way to a great run. We went through many different fields however it didn't feel as though we were simply running round a field - fantastic! Previously in the week, I was having trouble with my stump, stumpy, not feeling too good following on from a sprint session earlier in the week so I was quite worried whether he would be OK. Fortunately, he was fine throughout the course and we tackled all of the obstacles. The course had a lovely setting and was quite flat, with the exception of a few hills. We ran through a lot of forestry and we were able to create our own paths through the forest, as long as we stayed within the taped area. I feel as though I really got the experience that they were trying to create. I felt free, running through the forestry and over the hills - much like a real wolf. We conquered walls, large pits of thick mud and my least favourite - a swim in open water. I didn't fancy bypassing any obstacle so I swam through the lake and was happy to continue across the rest of the course. My favourite obstacle was the slide, which was about 150m of wet, slippery fun downhill into a shallow pool of water - so much fun that we ended up going down it twice! The marshals really seemed to be enjoying their experience on the slide and it was evident at every obstacle that they were happy and looked after. We ran to the end and managed a fantastic splash in the last muddy pool (obviously just to please the spectators). We were given our shirt, which I have to say was of great quality and it came in a little sealable bag to keep it free from mud - much needed after the last muddy obstacle. The only improvement I could say is the photography, which you have to pay for. Despite that, the sponsors Cliff Bar were giving out free samples and the event was free to spectate. It was £5 to park however you received a £5 coupon for inside the shop to use after your run. Although I personally found the course very easy, it was a great course that you could easily storm through and fantastic for newbies. I would definitely recommend to others and I will be coming back! P.S Please excuse the watermarks!